The highway to hell is paved with peril and precariousness for the deputy leader of the United Workers Party (UWP) Joshua Francis. 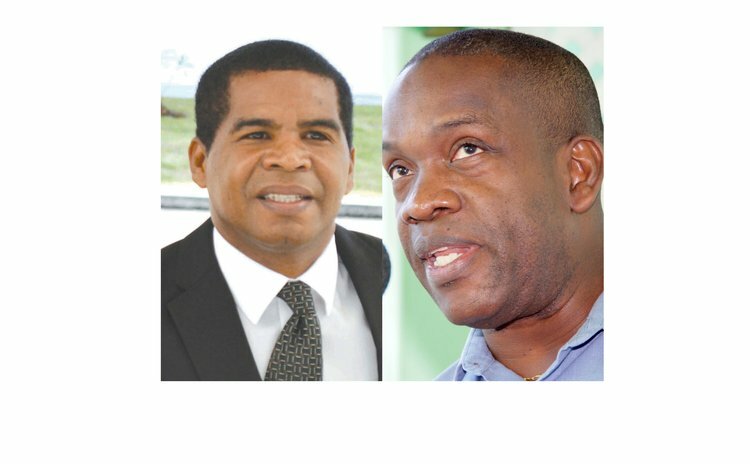 Having achieved the unthinkable by defeating Ambrose George, the seemingly invincible Dominica Labour Party Roseau South representative in the last general election, Francis has found himself in the unenviable position of having his own leader turn on him. Due to legal reasons The Sun cannot report on the reasons Lennox Linton has publicly called on his deputy to step down, other than to state that Francis has a dark cloud hanging over him. The widening schism appeared even more gaping late last week when Linton announced that a no confidence motion would be tabled at the party's delegates' conference in Mahaut on April 24, seeking Francis' removal as the UWP's second in command. Despite the discomfort he has caused the UWP hierarchy, Francis has refused to step down and has remained mum on his political future. "At this hour I wish not to comment on anything that has to do with my political future," a polite Francis told The Sun. Asked if he did not think he had a moral obligation to step down, he repeated the script. "At this hour I wish not to comment on any political matter." While political observer and government critic Athie Martin agrees that the first-time parliamentarian should adopt a low profile, he also believes Francis ought to step down until his matter is cleared. In fact, Martin told The Sun he was surprised that "the Joshua Francis that I know" keeps hanging on. "I am one of the people in Dominica surprised that he did not immediately step down and step back . . . .Why he hasn't stepped down, I really don't know. I have no idea . . . It's inexplicable, it's perplexing, and there is nothing he can gain from it," Martin said. He describes Francis as a man who usually takes the high ground and who has succeeded in portraying himself as a dedicated family man. It is for this reason he said, he was both disappointed in the young politician and worried about his family. "I can't explain Joshua's action and it disappoints me, it disappoints me, really. And it bothers me, it worries, it pains me. I see the young partner at risk of losing everything - his political career, his legal career, and his family. "Can you imagine what his wife must be going through? How must she feel? Why is he subjecting her to this?" Martin pointed to Iceland, where the prime minister stepped aside amid public outrage when it was discovered through the leaked Panama Papers that his family had sheltered money offshore. The local hotelier and environmentalist compared "the level of maturity displayed by the people of Iceland" with the Dominican public's response to the issue that led Linton to demand his deputy's resignation. "The people [of Iceland] were saying, 'we will not be embarrassed like that'. The Iceland situation shows how any civilized, civil people should respond." DLP acolytes have jumped on the opportunity presented by the rift, convinced that the UWP will be worse off for it. However, Martin sees it differently, arguing that it is the DLP which, at the end of it all, will be seen as the party that embraces immorality and distasteful behaviour. "In a strange kind of way, the organization that is going to come out a winner in this is the UWP. That's because they are the only political organization to come out, and come out early with a clear position on how to deal with the abuse of children [while] the Labour Party chose to play party politics with it by using Joshua as a wedge," Martin told The Sun. "The DLP is running the risk of being the party that embraced [immorality]." His position notwithstanding, it is impossible to miss the obvious discomfort that the situation has caused Linton, who, according to the Barbadian political scientist and pollster Peter Wickham, is getting a rude awakening in the world of politics. "I guess it's the kind of thing he is now understanding what politics is all about. It was easy being on the radio throwing stones, but managing a political party is a different thing," Wickham told The Sun. It's also a rude awakening for Francis who is travelling at the speed of light on the highway to hell with nary a stop sign in sight.